Easily grown in average, dry to medium, well-drained soils in full sun. Drought tolerant. Does well in poor, dryish, gravelly soils. Easily grown from seed, and may self-seed in the landscape if seed pods are not removed prior to splitting open. Once established, it is best to leave plants undisturbed because they develop deep taproots which make transplanting difficult. Asclepias speciosa, commonly called showy milkweed, is a rough, weedy perennial which commonly occurs on dry slopes, open woodland areas, roadsides, waste areas and along streams in western North America. It typically grows 2-4' tall on stout, upright stems with velvety, broad-oblong to broad-ovate, gray-green leaves (to 8" long) with conspicuous veining. Globular clusters (umbels to 3" across) of fragrant, pinkish-white to pinkish-purple, star-like flowers appear mostly in the upper leaf axils over a long bloom period from late spring well into summer. Stems and leaves exude a milky sap when cut or bruised. Flowers give way to prominent, rough seed pods (2-3" long) which split open when ripe releasing their numerous silky-tailed seeds for dispersal by the wind. Seed pods are valued in dried flower arrangements. Flowers are a nectar source for many butterflies and leaves are a food source for monarch butterfly larvae (caterpillars). No serious insect or disease problems. 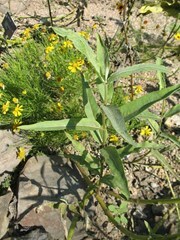 Somewhat weedy in appearance, but less spreading and a more manageable garden plant than common milkweed (Asclepias syriaca). Borders, butterfly gardens, prairies, meadows or naturalized/native plant areas.